Last year, we told you about an incredible new invention that’s helping a tag artist, who lost his ability to move, write with his eyes. 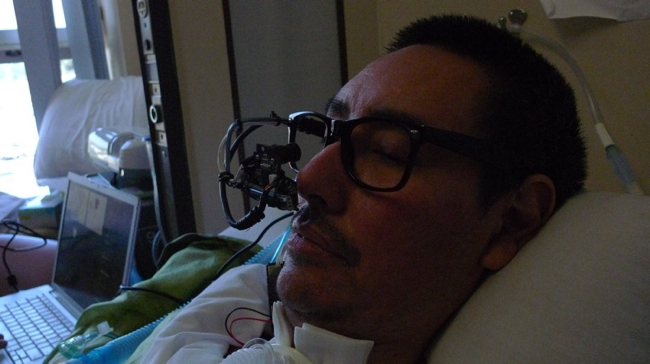 Now, a Kickstarter.com campaign is underway to raise money so that the artist, Tony Quan — aka TEMPT1 — can design original art and merchandise using the EyeWriter technology. TEMPT1 was a prolific graffiti artist in California, when he was diagnosed with Lou Gehrig’s Disease seven years ago. He’s paralyzed head to toe, and can’t speak, eat, or breathe on his own. His mind’s alert, though, and he’s still got plenty of creative energy to unload. TEMPT1’s friends and collaborators are hoping to raise $15,000 by October 19. For info or to donate, go here.